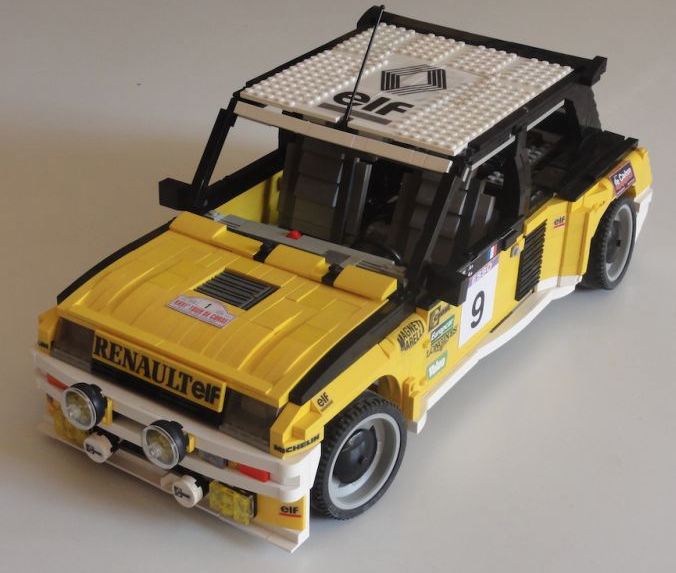 Nope, not an annoyingly generic 4-wide Lego creation, but Renault’s remarkable early ’80s R5 Turbo. The downside of all that power from such a small engine was chronic fragility, and the road-going R5 Turbo quickly gained a reputation for not working a lot of the time – which meant that it nicely set the tone for the next three decades of French automotive production. However, unreliable though it was, the R5 Turbo is still regarded as one of the greatest motoring achievements of the 1980s, winning four WRC events and pioneering turbo-charging for the masses. This brilliantly-built Model Team recreation of the 1982 Tour de Corsa winning rally R5 Turbo comes from MOCpages’ REGIS Michel, with Power Functions remote control drive, working lights, and some of the nicest decal-work* we’ve blogged. There’s more to see at his MOCpage via the link above. *This particularly excited our Elves for some reason. My name is Michael and I’m a long time reader of your blog. However, lately, in some posts (and I can’t think of a direct other example), in fact, this one, I’m not sure on your choice of words. Myself I’m not very active in the LEGO community as a builder, however I do follow the newswire, in terms of good or known builders that put up something new. Following some guys that spend their LEGO builder career just figuring out the best techniques for small scale cars, and when one pops up it’s just “an annoyingly generic 4-wide Lego creation”? I understand that not every 4-wide is amazing nor refreshing, however I have plenty of examples of every kind of scale, in which the same “annoyingly generic” creations appear. How about you respect and make kind words of every type of creation the LEGO community offers? If there’s something you don’t like about a creation, then don’t blog it and surely don’t mention it. Plus, I’ve been reading for long enough that I know there are plenty of 4-wides, even some pretty simple ones, that you’ve liked so much that it appeared on this blog. I don’t intend on offending anyone with this. I just wonder what’s your mentality on this subject. I built that R5 in 24 wide : I love building in very large scale, but si must admit that building 4 wide recognizable cars is a real thrilling challenge !